CHAPTER 4: MAPS AND LAY OF THE LAND. We started in Montreal (A). Over the course of a few days we drove Cacouna (B). Below are a few more maps. The United States (Maine) and New Brunswick are colored yellow. The St. Lawrence River flows west from the Atlantic Ocean through the north and south banks in the province of Quebec. 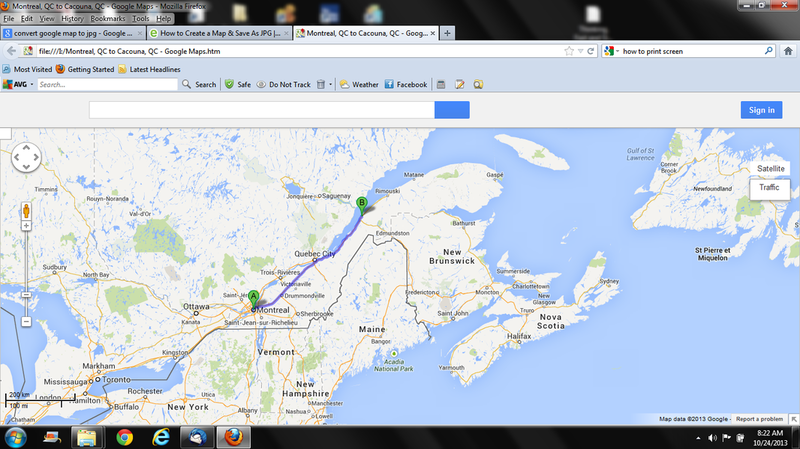 Montreal and Quebec City lie north of the state of Maine. The villages further to the northeast lie above New Brunswick, Canada. Montreal is a French speaking city with 57 - 68% of the population speaking the language at home. The number of English speaking inhabitants decrease the further northeast you travel. Map in hand, I enlist the assistance of the concierge at the hotel and ask directions to our first stop at La Prairie. The concierge stifles a grin at my pronunciation. But first we must determine how to get across the Champlain River.